Have you ever thought about charging your phone without even plugging into the charging ports or through wireless charging panel using Nanotechnology. We live in an innovative time where what we think can turn into possibility. Very soon users will be able to charge Smartphone with their finger swipes and can power their Bluetooth headsets by taking a stroll or walk around. Researchers at Michigan State University have found a smart way of harvesting energy from human motion. This has been achieved through developing a film-like device which can easily be folded in order to create power. 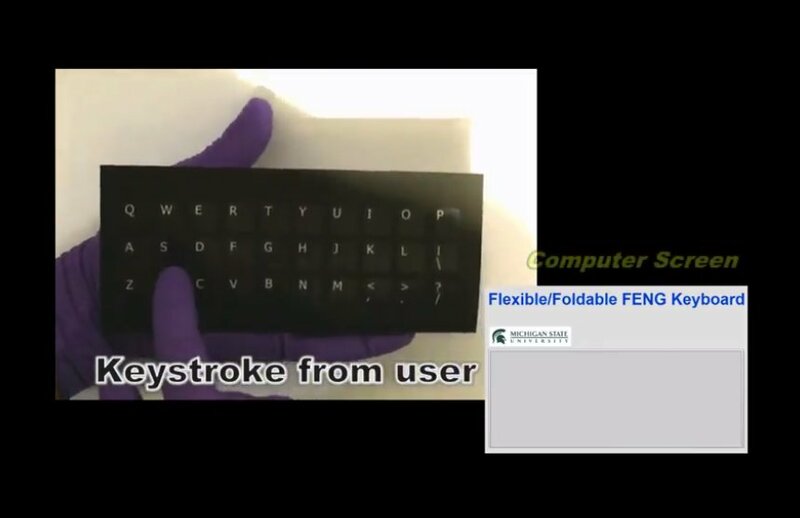 Researchers have made use of Nanotechnology which happens to be a low cost device and it helped in operating a LCD touch screen along with a flexible keyboard and a bank of 20 LED lights which can run simply on human motions. This groundbreaking invention of Nanotechnology will soon be published in the journal called Nano Energy in upcoming days. Researchers have developed a silicon wafer at the beginning filled with several layers. These layers are thin sheets made up of bio-degradable and environmental substances which include polymide, silver and polypropylene ferrorlectret. Later on ions are added to each layer which helps device in getting the charged particles. When this device is compressed by the human motion then an electrical energy is created which helps in powering up the electronic devices. If this Nanotechnology device is applied on the consumer electronics then users would have to bother with charging their gadgets every then and now. Once completed this device would be known as biocompatible ferro electretnangenerator or FENG. It will thin like a sheet of paper which will allow it to be making into numerous applications regardless of size. This Nanotechnology device has been able to power a palm sized LED light by harvesting energy from human motion. The biggest advantage which FENG offers is that it is lightweight and flexible along with being biocompatible and scalable. Being low cost it will help FENG in becoming the best alternative method of mechanical energy harvesting in the near future especially for the autonomous electronic devices. FENG will find a remarkable application for a wider range of electronic devices such as cellphones, touch screen devices and wireless headsets. The design of FENG is quite revolutionary in itself as it gets more powerful with each fold. Researchers have stated that with each fold users will get more amount of voltage with their motions. Users can start with a large device and keep folding it until it becomes small and can store more energy. It can folded so small that it turn into heel of the shoe and then it will go on harvesting energy form user’s walking as each time shoe strikes the ground. FENG will certainly help in harvesting energy right in the shoe and transfer it back to the wireless headsets to ensure it doesn’t run out of power. It appears to be part of science fiction but it has come into being.